Master caricature artist & illustrator Court Jones is one skilled guy. He’s got 20+ years of experience working for major magazines like Wired and Rolling Stone, not to mention dozens of other clients & teaching gigs. 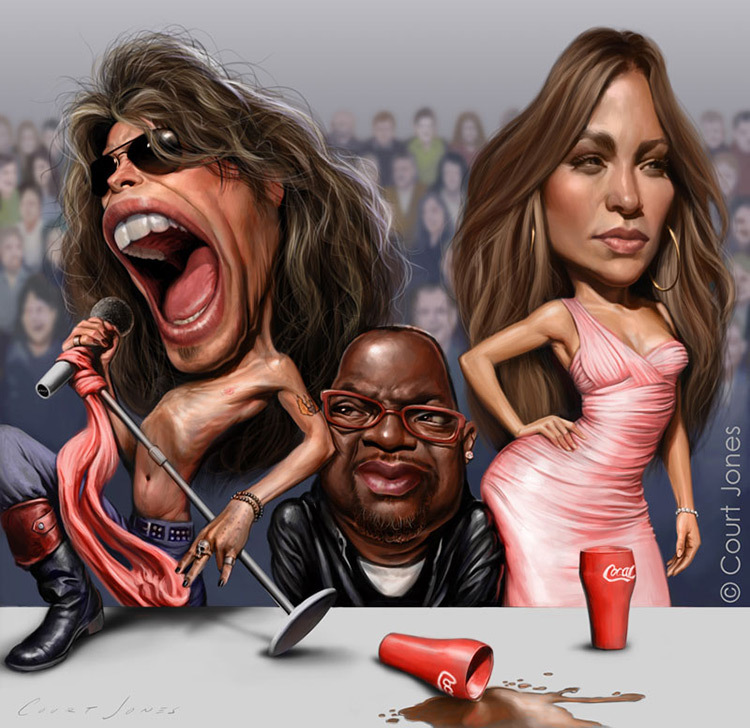 He’s also won many awards including the 2011 ISCA Master Caricaturist of the Year. Court has a knack for teaching and it shows in his new caricaturing course published by Proko. I reached out to Court for more details about his course and why it’s so valuable for all artistic styles from concept art to realist portraiture. If you’d like to learn a bit more check out his FB page or follow Court’s latest posts on Instagram @courtjonesartist. What’s your history with illustration & caricature work? When did you first get into art and when did you consider art as a viable career? I earned an art degree from the University of California San Diego(UCSD) which had an avant garde art program. So consequently, I had no idea what I wanted to do after graduation. I got a job at a local theme park as it was the only job listing I had seen looking for “artists.” It turned out to be quicksketch caricatures. After a few months the job started to grow on me. I was terrible at first, like all beginning caricaturists. But there were really awesome artists around me to learn from, and within a year, I began to feel somewhat comfortable doing it. Theme park caricatures don’t pay much. But it was GREAT training, and I was young, so I stuck with it. When I got hired for private events more regularly I began to see how you could actually make real money with this art form. So I quit the parks and focused on freelance event entertainment. Doing just events a few hours a week freed up a lot of time for me, so I began to take classes at The Watts Atelier, where my real education in art began. That led me to develop my skills as a painter and illustrator. What did you take away from your time at UCSD and later at Watts Atelier? Were those institutions crucial to your growth as an artist? UCSD, like many other colleges and universities, had a very modern approach to teaching art. There wasn’t really any practical training in how to draw or paint. It was mostly about concepts and creating conversations with art, which isn’t very useful in the real world. But I had to take a lot of art history courses. And those were definitely more interesting and useful than the studio classes. I’d say what I took away from UCSD was what I didn’t like about art and artists. Not to say it was a totally negative experience. But being trained in a modern art environment helped crystallize my tastes and sensibilities and gave me new focus on what I valued most, which was an appreciation for more traditional artists. When I found The Watts Atelier it was like a big shiny door had opened up to a new world I never knew was out there. At the Atelier the teachers actually taught procedures step by step. They demonstrated and critiqued students constantly. I learned about how to build a sketch in stages, how to set up different palettes, how to work with color, how to create a strong composition, how to ink, how to paint, the list goes on. After a couple years they started giving me my own classes to teach in various subjects, and that’s where I think I really learned how to teach and even create my own original courses. Do you think someone could teach themselves to draw/paint just from online resources? Or do you think a school is necessary to reach a professional level? There are several models for online art instruction now. And they’re all in their infancy compared to the brick and mortar school traditions. So it’s hard to say which is the most efficacious. I think all students learn differently and don’t all benefit from the same type of instruction. But the most important factor in growth is the student’s own ambition, discipline, and willingness to go over the exercises again and again. In my experience, the best teacher is constant repetition & sketching from the lessons – especially when it comes to the fundamentals. And instructor feedback is definitely important to the process. Although, given the nature of online courses which sometimes have followings in the thousands, one-on-one feedback isn’t always feasible. But with my course on Proko we make a critique video for every lesson. I pick several students’ homework assignments from the Proko Caricature Facebook group and comment and draw over them. Premium students get access to the full critiques. And I think it’s a really valuable resource for a student at home, even if I don’t pick their drawing to critique, because almost all students go through the same basic struggles. Your new caricature drawing course on Proko is phenomenal. Where did the idea for that course originate and what encouraged you to make it? Well, I knew Stan from the Atelier. He started there as a teenager and was teaching by about age 20, I think. After he left and began his online lessons in portrait and figure drawing I enjoyed following along with them at home, like so many others. And we kept in touch during that time. Being the entrepreneur he is, Stan decided to expand his offerings by teaming up with other teachers and he approached me about designing a caricature course. I had been mulling over the idea to start an online course of my own for several years and even made a couple rough episodes. But I realized I didn’t have the technical savvy to produce really slick videos, let alone distribute and market them. Stan had such a solid operation in place already and such high production values. I couldn’t refuse. I really wanted to be a part of that enterprise. How much effort goes into making each video like planning lessons, recording, editing, etc? I suspected there would be a lot of work involved, going into it. But I didn’t realize just how much it would take over my life. It was in development for over three and a half years before we were ready to launch. Granted, I didn’t work on it EVERY day, because I had to balance it with my freelance schedule. But there is just so much writing, drawing, and recording that goes into every episode. Each episode I estimate takes about 20-25 hours of work just on my end, when you include all the premium lessons. And then Stan’s large team of video production and marketing guys do their parts. Also I put a lot of thought into the course outline as well as the individual scripts to make sure they not only are good stand alone lessons, but fit into an over-arching theory on teaching caricature that is consistent, logical, and with a presentation style that would make sense even to inexperienced artists. I’m constantly judging myself by the quality of work Stan puts into his videos. His stuff keeps me pushing my own efforts, because I know his audience has a certain expectation of quality and thoroughness. Feedback from Stan and his team help keep me on track too. In the beginning they helped me a lot with my on-camera delivery, to be more natural. And of course when the team edits it all together with music, graphics, and effects, it makes me look much better than I really am on my own. So it’s definitely a result of collaboration with true professionals. What would an artist learn from following your caricature course? And what sort of skillset is needed before starting? Hopefully students get a good understanding of not only how to caricature, but how likeness, in general, works. Even in the best portraits there are often principles of caricature at work. So I think much of the course would be great for traditional portrait artists and illustrators. I also spend time showing how I develop a raw crude idea into a polished final rendering. Hopefully I help de-mystify the process and show how caricature is not reliant on any inborn gift. It’s just about focusing and doing the work to understand the principles. To get the most out of the course I would hope students have at least some experience drawing. No formal training is necessary. Just some experience with pencil and paper and a willingness to put in some time on the subject. What are the biggest differences between your free videos on YouTube and the premium course videos? The free videos on YouTube have the core principles of the lessons and at least one narrated demonstration of the concept. The longer versions in the premium course go into more detailed explanations or have an extended version of the drawing demo. Then, of course, the Premium option also includes lots and lots of narrated demonstration videos, downloadable files, and student critique videos. And there’s an entire bonus lesson just for premium students that goes really in depth on the history, construction, and proper use of the Reilly Abstraction. Can your lessons help artists following other paths like concept art, animation, or anything outside of caricature work? How do your lessons carry over into other fields? I think concept art and animation are actually major branches of caricature. To me, caricature is just the practice of purposefully controlling the design of the human form. Aside from using it to enhance the likeness and make people laugh, you can also caricature someone to bring out any other traits. You can use the same principles to make a drawing more beautiful, more masculine/feminine or scarier than the original model. When concept artists and animation designers do their thing, whether they’re designing a robot, zombie, or talking candlestick, they are just creating altered versions of people for the purpose of telling a story. 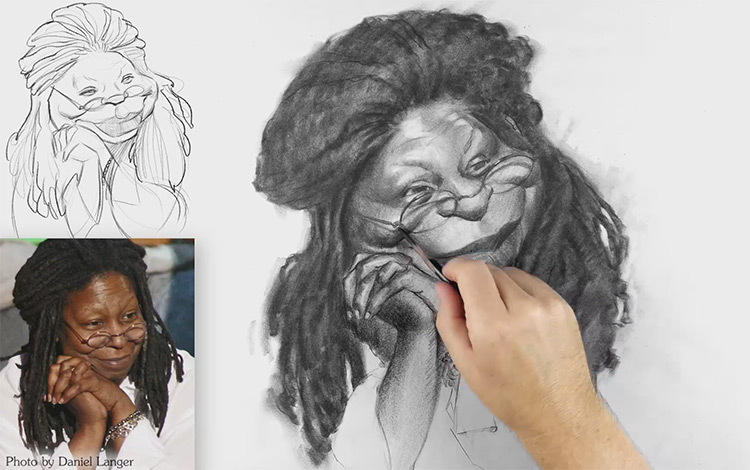 Caricature helps artists create strong character types & insert personality into the work. This gives artists the confidence to design with more intention and humanity. How would you define “style” in art and what factors go into an artist’s style? Can your course help artists develop their own style? To me “style” is the manifestation of an artist’s training, influences, and materials. It’s also a representation of what an artist values or sees as important to express. And because of that I strongly encourage aspiring artists to avoid learning to paint by working only digitally. Painting software is capable of literally any look or style, and gives the ability to endlessly overwork over a painting without consequence. In my opinion, artists who have only worked digitally tend to have a very bland and sterile look to their portfolio. The brush strokes have no personality or are entirely smoothed over and more often than not, colors are sampled directly from the reference photo. Whereas artists who learn painting in natural mediums like oils, gouache, or watercolors and with limited palettes are influenced by what those mediums can do. So they find creative ways to get certain effects and usually develop a more individualized color sensibility. Once an artist attains a certain comfort level with a traditional medium they can then go into the computer and bring their own uniqueness to the process. Their digital work will naturally be heavily influenced by their traditional painting experience and will be a lot more interesting to look at. So because I go into so much detail showing my process, I think it’s likely that my caricature lessons will have some influence on my students’ individual styles in the beginning of their development – especially as it relates to drawing and design. But as they gain more experience and study other artists they will branch out and develop their own unique styles. What sort of balance is needed between practicing realism & exaggeration? How does realist work help a caricaturist/illustrator improve their ability to exaggerate or draw from imagination? I’m a big believer in cross-training in art. I think every subject you study helps influence and improve your work in other areas. Caricature can help portraitists and realistic illustrators to improve upon their reference photos and insert more life or enhance a likeness when necessary. And of course the control & discipline you learn when practicing more traditional “realistic” drawing of the face and figure, the more subtlety and sophistication will appear in your caricature work. 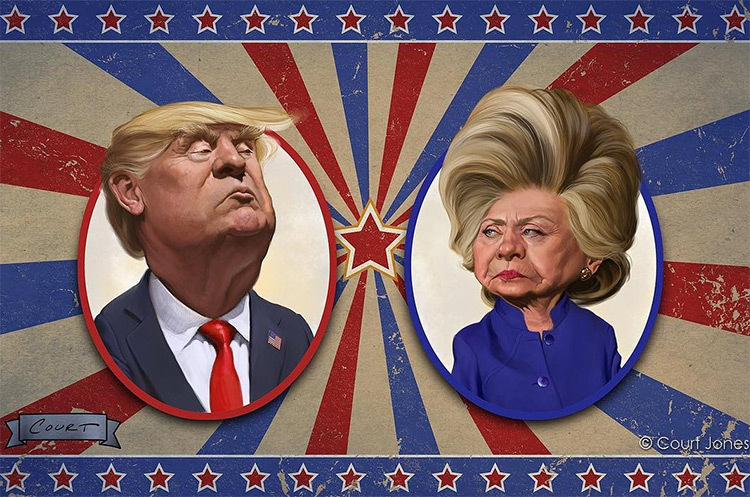 In my experience, art directors at magazines really like to see realism in the caricature art. But I advise against just designing for the art directors or trying to imitate a popular style. Try to draw and paint in a way that makes YOU happy and the right clients will eventually be attracted to you. What common mistakes do artists make when first learning to exaggerate? Is it ever “too early” to start experimenting with exaggeration? Both problems usually result in weak likenesses. For the first type, they don’t spend enough time experimenting with exaggeration choices and get stuck in the safe “portrait zone”. I encourage them to put more effort into the thumbnail concept stage. For the second type, who draw too sloppily, I encourage them to spend more time refining their rough sketches using tools like the Reilly Abstraction to find & fix their structural errors. But it’s never too early to start experimenting with exaggeration. With the way I teach caricature, the first step is figuring out the direction of the exaggeration with quick thumbnail sketching. In the subsequent step of the rough sketch I emphasize likeness as the priority. And then next is refining the construction with the Abstraction. I’m a strong believer in breaking down a complex task into smaller more manageable steps. What parting advice can you share for artists just starting on their journey? Be ready to do a lot of sketching and repetition. And don’t rush to learn painting or rendering too soon. Sketching can seem boring compared with painting. But most artists’ painting problems can be traced back to poor drawing fundamentals. Just like with learning a sport or musical instrument, you need to have good fundamentals under your belt before you can produce high-quality work consistently. The fundamental training period is when you’ll develop not only your hand but also your eye, your ability to discern good design from bad. There’s no shortcut to learning that kind of thing. Many thanks to Court for taking time to answer these questions & offer his insights into the wild world of caricature. If you have any interest to improve your exaggeration skills then check out Court’s caricaturing course on Proko. It’ll definitely help you see improvements no matter how long you’ve been drawing or what type of art you make. You can also learn more about Court on his main website or on his fine art portfolio. He posts a lot of work on his social accounts like Facebook and Instagram if you’d like to follow there as well. And if you wanna check out Court’s free caricature videos you can browse this playlist from the Proko YouTube channel. We also wrote a detailed review of Court’s caricature series if you wanna see exactly what it offers. What is an Art Atelier?